Cornucopia’s Take: Sewage sludge contains toxic wastes, including pharmaceuticals, household and industrial chemicals, and heavy metals. Many industrial chemicals, including compounds called PFAS used to make heat-resistant, stain-proof, and nonstick products, are unregulated. Very small amounts of PFAS compounds have serious health implications, and recent testing has revealed dangerous levels in Wisconsin water. More than half of all sewage sludge is spread on farmlands, according to the EPA. 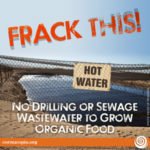 Organic standards forbid the use of sewage waste on farm fields used in organic production. Detection of a toxic chemical in a northeastern Wisconsin wastewater treatment plant’s sludge has prompted a halt to application of the material on nearby farms and raised broader concerns about how public sewer systems across the state may be spreading the chemical across the landscape. The contaminated sludge in Marinette also highlights unease and confusion in local communities over the absence of enforceable federal or Wisconsin environmental standards for the chemicals — often referred to by the acronym PFAS — despite at least two decades of research linking them to serious health problems. Marinette has the worst PFAS contamination of drinking water that has been detected in the state. Private wells serving dozens of homes in the neighboring town of Peshtigo are affected, many with PFAS levels exceeding a federal health advisory. Tyco Fire Products, the local company blamed for the pollution, has installed water treatment systems and distributed bottled water in dozens of homes. What has drawn less attention is that the virtually indestructible PFAS compounds continue to flow from the company’s testing facility, sometimes for days at a time at rates of more than a gallon a minute, into the sewer system. The system dumps the compounds into Green Bay, which is the area’s main source of drinking water. Trace amounts have been detected in drinking water drawn from the bay. PFAS also has been found at higher levels in sewage treatment sludge called biosolids. Until recently the material was spread on about 100 acres of farm fields annually. Some of the chemical has likely ended up in plants grown in the fields, and some has almost certainly drizzled through soil and contaminated groundwater that serves as a source of drinking water for people who live nearby. There is no law against spreading the chemical on farm fields in Wisconsin. But not having a standard for how much PFAS can safely be spread on fields has bothered regulators at the state Department of Natural Resources enough that in September they asked the wastewater plant to voluntarily stop spreading. Since then, plant employees have started dumping the sludge into a storage tank. It’s not clear what will happen after the tank is topped off in about a year. 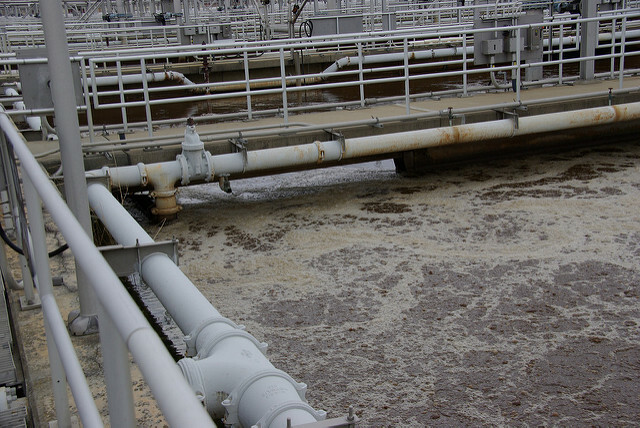 Wisconsin has about 90 major municipal wastewater treatment plants that can handle at least 1 million gallons of sewage per day, according to the state Legislative Audit Bureau. The DNR regulates a total of more than 900 major and minor municipal and industrial treatment plants. Unlike states with more advanced programs to protect residents from PFAS, Wisconsin hasn’t mounted a statewide effort to find the chemicals at their original sources, or at the treatment plants that can extend their reach. Neighboring states have found PFAS contamination that is costing hundreds of millions of dollars to clean up. Some have set their own safety standards, which permits greater efforts to find and respond to polluted areas. Contamination in Wisconsin began coming into the public eye more recently after the U.S. Environmental Protection Agency pushed water supply systems and military bases to test. In Madison, heavy PFAS contamination of groundwater at Truax Air National Guard base is the likely source of low levels detected in a nearby municipal well. A Madison Metropolitan Sewerage District spokeswoman said the system hasn’t considered testing wastewater or the 33 million gallons of biosolids spread on 4,500 acres annually. Spokeswoman Jennifer Sereno said there are no known PFAS sources hooked up to the sewer system. Sereno said at Truax, sanitary sewers connect only to “domestic” waste sources. She said the treatment plant hasn’t experienced foaming wastewater of the type associated with the PFAS-based firefighting foam that is the main cause of contamination at the air base. However, according to a 2015 Air National Guard assessment of PFAS contamination at the base, Truax personnel had received complaints from the city about foaming wastewater. And the report describes areas where spilled firefighting foam would routinely be washed into the sanitary sewer drains. Sereno referred questions to Truax, which didn’t respond to requests for more information. PFAS compounds are synthetic chemicals used to make heat-resistant, stain-proof and nonstick products. Anywhere manufacturers or heavy users dump the chemicals down sewer drains, they end up at wastewater treatment plants that distribute them around the environment where they can end up in food and drinking water, said David Andrews, senior scientist at the Environmental Working Group in New York. Industry has created more than 3,000 PFAS compounds, and new ones have regularly been introduced. Some have been in use since the middle of the last century. Relatively few have been extensively studied. Research shows they accumulate in animal tissue, and are associated with diseases of the liver, kidneys, glands and immune system. They escape treatment plants through the processed wastewater that is deposited into public waters and the treated sludge spread onto farm fields, Andrews said. Modern sewage treatment processes eliminate many of the inherent hazards that would otherwise be carried into the environment with sewage byproducts — but PFAS compounds aren’t rendered harmless by those processes, Andrews said. Researchers have found the three most likely places for PFAS-contaminated drinking water are near companies that manufacture products with the material, places such as military airfields that are heavy users of those products, and wastewater treatment plants. PFAS investigations that could lead to cleanups have begun at several Wisconsin military bases, two sites around Manitowoc, plus Madison and Marinette. The contamination in Marinette along the Michigan border was discovered as Tyco conducted an EPA-supervised cleanup of arsenic around its manufacturing plant along the Menominee River. Testing and training with PFAS-based firefighting foam has taken place at the nearby Tyco Fire Products facility. The company has taken several initial steps to address drinking water contamination in private wells serving homes. As part of its training and testing exercises, Tyco sprayed firefighting foam on the ground for many years before stopping the practice in 2017. Tests of wastewater in a sewer line near the Tyco testing and training site found concentrations of 3,670 parts per trillion of a PFAS compound for which Michigan has set a water quality standard of 12 parts per trillion. The compound was found at 48 parts per trillion in a sewer line near a Tyco supplier that operates on land leased from the company. Levels above and below the Michigan standard were found in untreated and treated wastewater closer to the plant. It has also been found in biosolids. A spokesman for Tyco’s parent company, Johnson Controls in Milwaukee, has said contamination was primarily from “historic” training and testing of the foam, and that the compounds in the sewer system could have come from several sources. But on Saturday the spokesman, Fraser Engerman, conceded that the company continues to generate PFAS wastewater from indoor testing. Most is trucked away, but a portion is still being dumped “at a slow rate” into the city sanitary sewer, Engerman said. Engerman didn’t respond when asked about the suggestion of city water and wastewater operations manager Warren Howard that Tyco voluntarily reduce or end PFAS discharges. Howard said members of the public are greatly concerned, but the absence of state and federal regulations means he needs to be careful not to overstep in dealings with Tyco. Howard and other city officials talk regularly with Tyco and the DNR about topics related to PFAS. They have talked about how permanent replacement water supplies may be provided to residents who wells are contaminated, and about the problems caused by contamination of the sewage plant, he said. “We’ve had a lot of dialogue with them (Tyco), and we hope they would see our point of view and want be ahead of the curve instead of behind the curve,” Howard said. In November 2017 when Tyco first told city leaders about PFAS contamination of groundwater, Howard was like many in Wisconsin. He’d never heard of PFAS and had to learn quickly. He oversaw tests to measure PFAS in wastewater, biosolids and drinking water from the bay. For decades, Tyco had been notifying the wastewater plant before it dumped the firefighting foam into the sewer line, not because of any hazards associated with PFAS, but just to give plant personnel a chance to prepare. On the treatment plant grounds Tyco’s wastewater would churn up into so much foam that it could become a nuisance, blowing around in the wind, Howard said. The company supplied a chemical agent to keep the foam down, and complied with requests from plant managers to reduce the rate at which they sent the material down the sewer pipe. In 2016, the EPA set a health advisory level for two PFAS compounds in drinking water, but advisories aren’t as easily enforceable as legal standards, and an advisory level doesn’t open the door for several types of cleanup funding. The agency has said it will soon announce a national management plan for dealing with the compounds. The DNR has taken some first steps in a years-long process that could lead to water quality standards for some PFAS compounds. In March the DNR asked the state Department of Health Services to consider recommending health advisory levels that could be used to create groundwater standards for two of the roughly 3,700 known PFAS compounds. After a request by the Merrimac-based Citizens for Safe Water Around Badger, the DNR agreed this month to work with DHS on considering 24 other PFAS compounds that have been detected in Wisconsin. The pace of the evaluation will depend on the DHS workload, said Steve Elmore, a manager of DNR programs to protect groundwater and drinking water. “Every state is grappling with this,” Elmore said. In August, the DNR established a PFAS standard for cleaning up soil at contaminated sites, but big businesses say it was set too quickly. The standard could be rescinded. The DNR is seeking to hire two people to coordinate the department’s response to PFAS. About four years ago in Michigan, after it was learned that sources of drinking water for millions of state residents was contaminated, that state set standards for two of the most well-known PFAS compounds. The state has been testing not only drinking water sources, but 93 wastewater treatment plants that have major industrial customers.